Hey, everyone! I’m pretty excited about the project I’m sharing with you today and I think you’re going to like it. I mentioned before that my niece and nephews LOVE Pokèmon and I recently made a bunch of pokèballs for them. 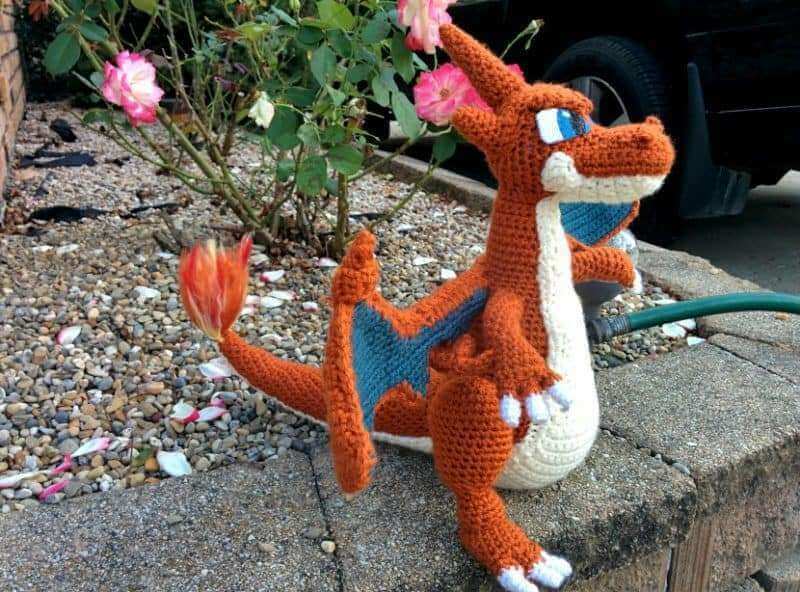 Well, that same day, we talked about how cool it would be to make the actual monsters and my nephew asked if I would make him a crochet Charizard. I spent some time looking up patterns I could use (since I didn’t want to design one myself) and I came across one that looked perfect! Today, I’m going to show you the finished product and do a little review for this crochet pokemon pattern. This is the kind of project that I love. It’s something different and creative. It has lots of parts and pieces, but they’re all worth it when you get something this cool in the end. I had so much fun making this and sharing the progress on my Instagram and the Facebook Page, and now I can finally show the finished result and tell you a little bit about it! The original pattern for this is by Ana Amelia. If you like anime and geeky characters, check out her blog because she has some amazing things on there! At first sight, this pattern was absolutely perfect and so detailed that I didn’t feel the need to change much. And the things I did change were personal preferences that didn’t have much to do with the actual pattern. 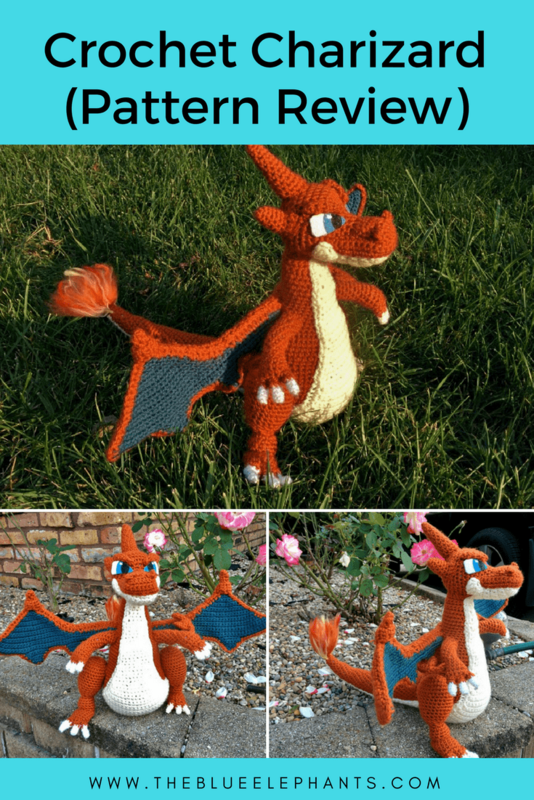 Even though this is a free pattern, I wanted to review it because there is a lot that goes into this crochet pokemon pattern. If you’re starting it, I thought it might be helpful to know what you’re getting into. 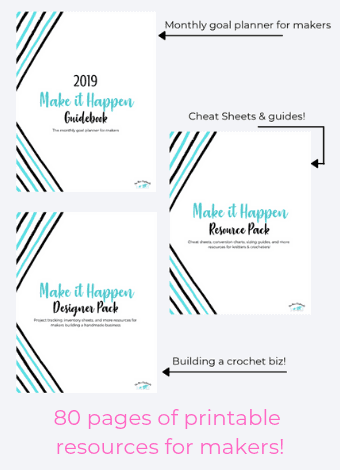 The pattern itself is very detailed and the designer has TONS of pictures of each part and steps to show you what to do. Some of the more tricky elements even had a video to walk you through it. I found that super helpful when making the snout for Charizard. She also uses some wire inside to make the Charizard sturdier and goes into detail explaining how to shape and insert it. It wasn’t listed in the materials, so it was a little confusing when she starting using it. I chose not to use wire in the end. I see how it helps the character stand, but more on that below. The only things I really changed was the main body color and the wires used to give it support. For the color change, I felt like the light orange she used was too bright. 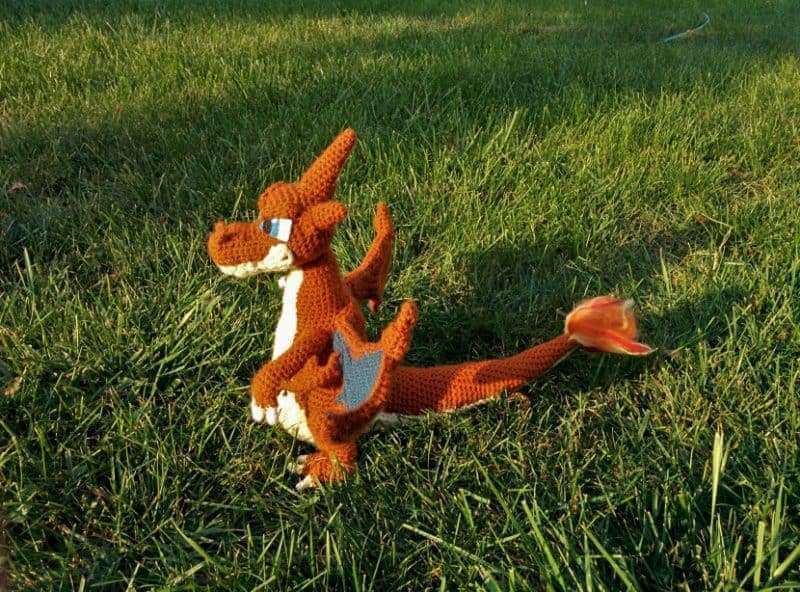 From other pictures of the character, I decided that I wanted my crochet Charizard to have a deeper shade of orange for its body. So, I used I Love This Yarn in Burnt Pumpkin. The other thing I changed was the use of the wire. At first, I missed it entirely because it wasn’t listed in the materials. But I read through the pattern and the last few steps use a thick wire to help join all the pieces and support their weight. Because I was making this crochet pokemon pattern for my little nephew, and I knew he was going to actually play with it, I didn’t put a heavy wire inside it. I didn’t want it to come out and poke him or anything. So I skipped that for most of the Charizard and instead I used pipe cleaners in the wings and tail. I wanted the wings and tail to be posable and still stay up on they’re own, but not be so sturdy that it might hurt my nephew if it did come out. And I think the thicker pipe cleaners work really well for that. While I was making this, I couldn’t quite see how it would work out and where all the pieces would go. This is probably the most involved crochet pokemon pattern I’ve seen since most are cute little amigurumis. But I decided to make all of the body pieces first, pin them together to be sure everything looked right, and then sew them together. Then, I made all the little facial features and positioned them. The last thing I added was the eyes and it brought the whole thing together. I love Ana’s crochet Charizard. More importantly, my nephew loved it. The instructions were clear and easy to follow. She even had a video on how to do the head because it got a little bit tricky there. 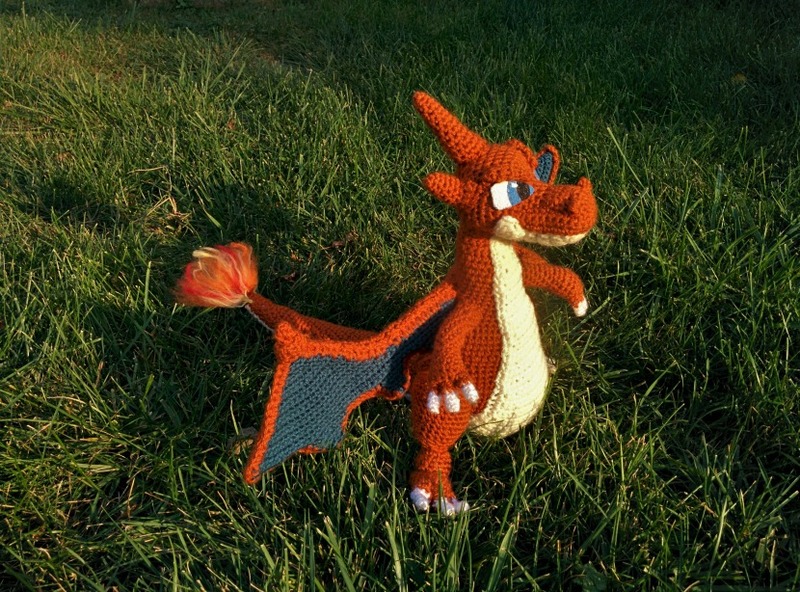 After looking around her site a little bit, I saw a bunch of other great amigurumi patterns, including a black version of Charizard. You can get the pattern for this one (and the black one) right here. 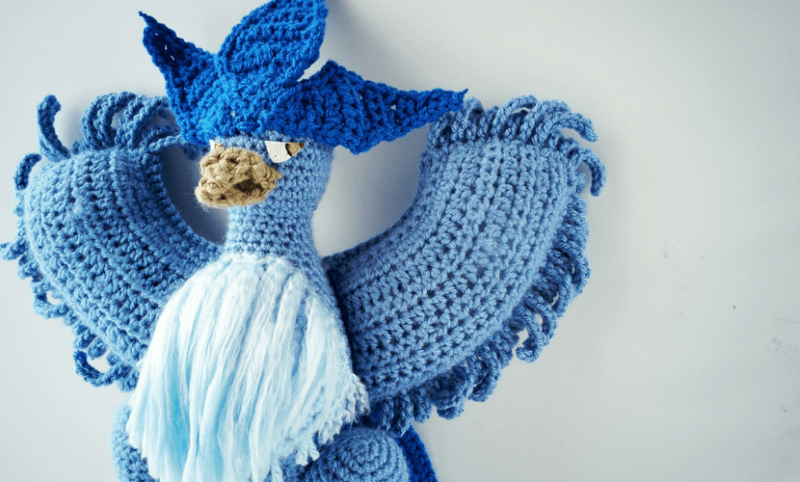 This crochet pokemon pattern actually inspired a whole bunch of others. 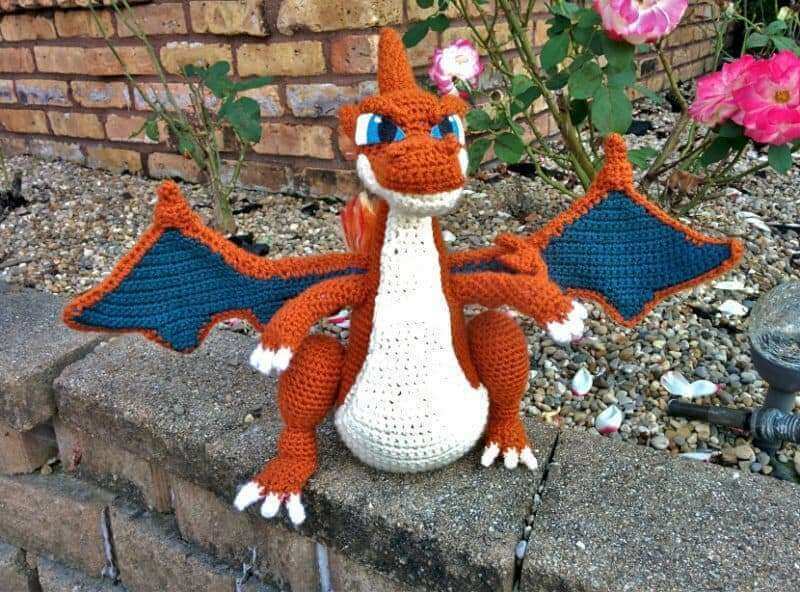 Once I made this Charizard for one nephew, all the other kids wanted one too! Crochet seemed a lot more interesting to them once it was a character they knew and loved! So, I made some more crochet pokemon for my other nephews and my niece. Thanks so much for reading everyone! 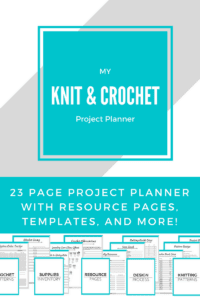 If you’re looking for more geeky crochet patterns, be sure to visit Mia’s Atelier! 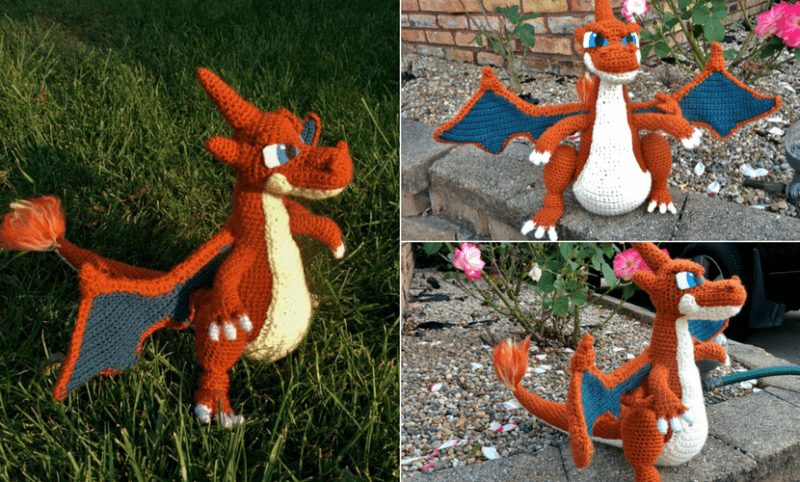 I was blown away by her crochet Charizard pattern and now that it’s actually a few years old, her newer patterns are even more impressive! For more patterns from me, use the box below to sign up for the newsletter! I post every week and share patterns, tutorials, tips and more about knitting and crochet. It’s totally free and you’ll also get access to the subscriber-only resource library when you sign up. In the comments, let me know your favorite Pokemon and I will see you soon! OMG this is the cutest thing ever! I really wish I knew how to crochet just so I could make me one, that my kids will try to steal. Thanks for sharing at the Wednesday Showcase party! haha thank you! I gave this to my nephew and it sort of sparked a crochet Pokemon craze, so I’m making more Pokemon for all the other kids in my family! I’m not even into Pokeman and I absolutely love this! Your craftsmanship is spot on. I love crocheting amigurumi creations, but sometimes they feel like they take forever. I know a lot of time went into making this. Great work! Thank you so much! A lot of time did go into this, but I can’t take all the credit since the pattern was someone else’s. This is one of my favorite types of projects though, so even though they take forevverrr, I love seeing the finished product in the end! I’ll be sure to check out your party, it sounds so fun! WOW you are very talented! I tend to congratulate myself when I manage to crochet a blanket that’s actually square lol. Thanks for linking up at Share the Wealth Sunday! lol! Thank you, Carly. I have those days too though, where no matter what, things are a just little skewed lol. My son would LOVE this! He’s going to be Charizard for Halloween this year. 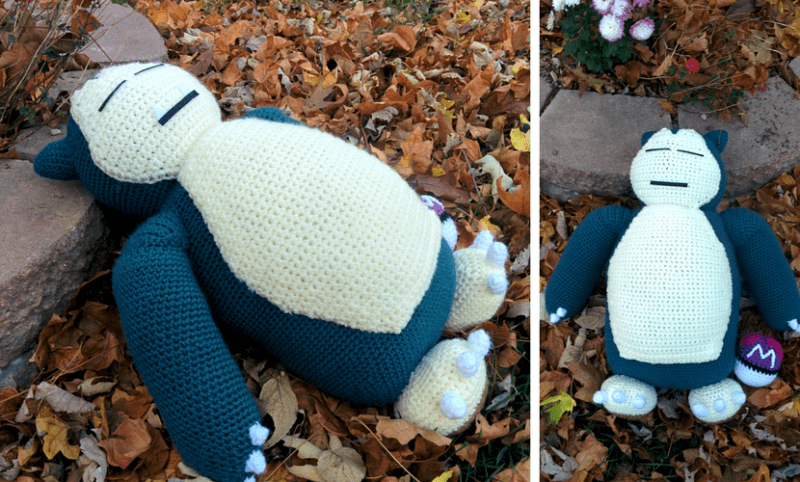 I need to learn how to crochet so I can make one for him! That’s awesome! It would be so funny to see kids dressed as Pokemon running around on Halloween lol. This pattern uses really basic stitches, so it isn’t difficult, but it does have a lot of parts and takes some time. Worth it though! He’s just brilliant. I like how you made him suitable for play, thats important for kids, I’m sure your nephew would rather a slightly floppy Charizard he can play with to one that he wasn’t allowed to touch!